Keep your water cold 4x longer! 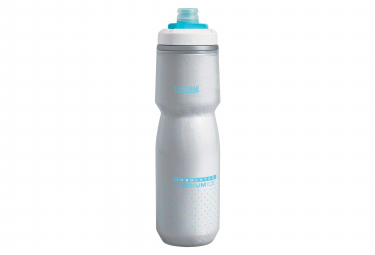 We re-engineered our legendary Podium® Ice™ to be the ultimate insulated cycling bottle, even when temps rise into triple-digits. With unmatched aerogel insulation technology, high flow rate and easy cleanability, the Podium Ice stands second to none. And like our entire Podium collection, it's 100% free of BPA, BPS and BPF and features improved cage fit and the squeezability that CamelBak is known for. Aerogel Insulation: Keeps water cold 4X longer than other bottles. Dimensions: 7.4 x 7.4 x 26.3 cm.